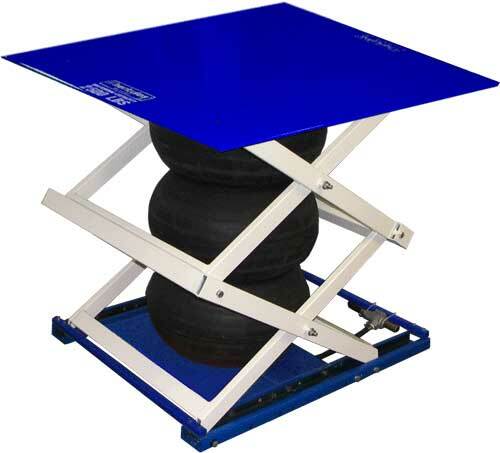 Improve ergonomics and productivity inexpensively with the A-Series Lifts. These cost efficient lifts, powered by Herkules patented Air Bag technology, raise pallets, bins and other materials to your desired working height. Various optional components are offered providing you with tremendous flexibility. 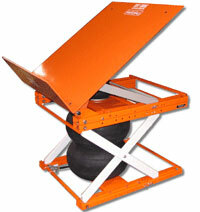 Tilts, rotates, conveyors, and other parts can be added when you first purchase a lift or later when you need them. The A-Series Lifts offer solutions for hundreds of different applications. Very few components make up an A-Series lift. Each high strength steel part is powder coated for maximum performance. This innovative "bolt together" design provides an affordable ergonomic solution with rugged durability. *Ship Weight is based upon standard platform size. 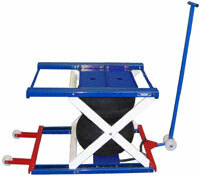 Four heavy duty casters & two foot brakes provide easy and safe mobility for your materials. 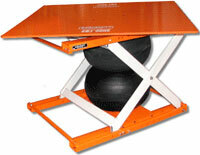 This option is available for lifts with 3,000 lbs capacity and under. A conveyor package allows you to integrate a lift & conveyor with your material handling system. A rotation package allows easy access to all 4 sides of the material, improving ergonomics while loading and unloading. Spring detents are also an option for fixed stop points. Any option can be easily added to an A-Series Lift. If your needs change, you can remove one option and add another, without replacing an entire lift. This can drastically reduce future equipment costs.